Back cover blurb: Audrey Hart is on the Isle of Skye to collect the folk and fairy tales of the people and communities around her. It is 1857 and the Highland Clearances have left devastation and poverty, and a community riven by fear. The crofters are suspicious and hostile to a stranger, claiming they no longer know their fireside stories. Then Audrey discovers the body of a young girl washed up on the beach and the crofters reveal that it is only a matter of weeks since another girl disappeared. They believe the girls are the victims of the restless dead: spirits who take the form of birds. Initially, Audrey is sure the girls are being abducted, but as events accumulate she begins to wonder if something else is at work. Something which may be linked to the death of her own mother, many years before. Anna Mazzola’s second novel is a deliciously dark fairy tale, inspired by the West Ham vanishings. The unexplained disappearance of a number of children/teenagers from London’s East End in the 1880s and 1890s. However, there is a stark difference of location. Here we do not see grubby street urchins and filthy streets of our historical capital, instead we see the beautiful landscapes of the Isle of Skye. 1857, Audrey Hart, arrives on Skye to collect folk and fairy tales from those around her in the community. But her new community although close knit are suspicious and distrusting of strangers, particularly those that they perceive to be meddling into the islands history and superstition. When Audrey discovers the body of a young girl washed up on the beach, she is shocked to hear that another young woman has been missing for a number of weeks. The local community believe that these young women are the victims of the restless dead. Spirits that take the form of birds. Audrey is unsure whether this is folklore or fact, but is determined to find out. Her own mother was the victim of an untimely death on the same island. Audrey has always believed it was a tragic accident, but now she begins to wonder if there is more to it. The story keeper is exactly that, a story to keep, and treasure forever. A wonderful piece of historical fiction. 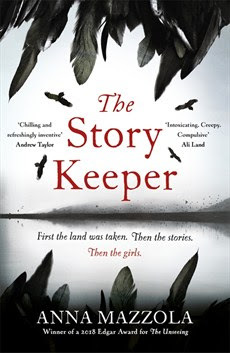 The Story Keeper is available now via Amazon online and all good book shops.